A new term seems to have settled for vehicles like this: CUV. Crossover Utility Vehicle, not simply “crossover vehicle,” which has been used for a while. Meaning, basically, an SUV with unibody construction, like a car: the chassis, floorpan and body are all one piece, which adds rigidity to the structure, saves weight and rides softer, but isn't as rugged as a body-on-frame vehicle, like a pickup truck or an SUV built on a pickup truck platform. Fine. But who can tell? 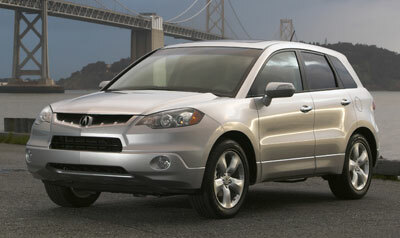 Acura calls the all-new 2007 RDX a CUV. Here's the irony: it earns the name because it's sportier than a Sport Utility Vehicle. Sporty driving is what this CUV-formerly-known-as-SUV is all about. The RDX most resembles the BMW X3, which BMW separates from the SUV crowd by calling an SAV: Sport Activity Vehicle. Got it? What makes the RDX different is that it uses a turbocharged four-cylinder engine to make its hearty 240 horsepower, rather than Honda's smooth V6. Because the RDX is built on the small Honda CR-V platform, there wasn't room under its hood for the V6. This is the first turbocharged engine that Acura has produced. It's 2.3 liters, and comes out of the Acura TSX, with many changes making a completely different powerband. Proving its commitment to sport, the RDX uses a sequential five-speed automatic transmission with paddle shifters, a firm independent suspension made for cornering, and Acura's patented SH-AWD (Super Handling All Wheel Drive) system, which delivers a higher proportion of power to the outside rear wheel under hard cornering, thus keeping the car on line. But also proving a commitment to luxury, the RDX offers only leather, no cloth interior, and other standard luxury touches, such as a power moonroof and dual-zone climate control. That narrows the intended buyer down, to someone who doesn't want to compromise the cornering for a comfortable ride (the firm suspension), but isn't willing to sit on cloth seats. Also someone who doesn't care about dramatic or distinctive styling, because the RDX closely resembles the Honda CR-V. Women, who normally go for the Acura approach toward silky style with performance, will want to think twice about the niftiness of the RDX. Acura RDX ($32,995) comes with leather upholstery, heated front seats, power moonroof, 18-inch alloy wheels with all-season tires, xenon HID headlights with foglamps, the 2.3-liter turbocharged four-cylinder engine, a five-speed automatic transmission with paddle shifters on the steering wheel, the patented SH-AWD (SH for Super Handling) system, four-wheel disc anti-lock brakes with electronic brake-force distribution. The RDX Tech ($36,495) features the Technology Package: a 10-speaker, 410-watt sound system designed by legendary recording engineer Elliot Scheiner, navigation system with voice command, rearview camera, hands-free phone interface, XM satellite radio, and the AcuraLink Satellite Communication System with Real Time Traffic. Safety features include dual-stage frontal airbags, side airbags in front, side curtain airbags with rollover sensor, electronic stability control (VSA), active front head restraints, side-impact door beams, and a tire pressure monitor. The RDX received a 2007 “Top Safety Pick” from the Insurance Institute for Highway Safety, which crash-tests cars more thoroughly than the government (NHTSA). The Acura RDX is built on the Honda CR-V platform, as the TSX is built on the Civic platform. The RDX about one inch longer in wheelbase than the CR-V, and two inches longer overall. The appearances of the two cars are similar enough that you'd never look at them and say that one should cost $10,000 more than the other; in fact, some might think the Honda is better looking. The sculpting on the sides of the RDX appears gratuitous, not dynamic, and less traditional than that on the CR-V, which seems to have some reason, at least. The nose of the RDX is its most distinctive feature. The grille is a wide shallow vee, the Acura theme, but under that is a black air intake with opposing angles, riding on top of the bumper. It's the highest undisguised air intake we can think of. And under the bumper is another air opening. The intercooled turbo under the hood needs a lot of air. Behind the C pillar there's a small window that you can't really discern because the C pillar is black and the window is tinted so darkly. From the inside, it affords good visibility, no blind spots when looking over your shoulder. The rear end of the RDX resembles a Subaru Tribeca, an observation which, based on most opinions of the Tribeca's Edsel-like tail, is something shy of a compliment. Between the taillights, the sheetmetal on the liftgate is molded into the shape of the vector, again suggesting the Acura symbol or theme. This sculpting surrounds the large license plate indent, so the suggestion is mostly lost. You'd have to look a long time, like we did, to see it. The front doors open without the solid notchy click that we're used to hearing, when car doors open. It felt like the door wasn't closed all the way. But it was no mistake; we drove two RDXs, one for five days in California and another for 14 days in the Northwest, and they both were like this. The RDX dashboard fairly cascades with colors, textures and levels. The top is wide and flat, black vinyl; there's a three-inch tall strip of dark titanium plastic in the center, broken by the display screen; and at the bottom it turns to smooth vinyl in light gray. The top and plastic strip are grained with minutely raised crossed diagonal lines, a sort of diamondy golfball effect. So there are three textures and three colors. On the top center of the dashboard, tucked under the windshield, is a narrow digital display that indicates time of day, radio station, the interior temperature setting on each side of the car, and where the vents are pointed. It's hard to see in sunlight. The navigation system is controlled by a big ugly knob in the center of the center stack. It pushes in, up, down, left and right. Acura has an excellent reputation for its nav systems. Our test model was the RDX Tech. Its rearview monitor, in the display screen, was as bad as any we've seen. Its focus is fuzzy, it's dim at night (which might be from dim backup lights), and it's often too dark to be useful, at dusk or on overcast days. The perforated leather seats (standard) are comfortable, and the driver can perch herself or himself up high, to see over the short nose of the car. The front seats are eight-way power and heated, with high and low heat settings. There's lumbar support, although we still got a crick in our back after a four-hour drive with a lot of stressful freeway stop-and-go. The gauges are nicely lit at night, in blue and white. The tach is at left, redline 6800, with an insert that shows turbocharger boost, from 0 to + (plus), with no numbers to indicate units, which would be pounds per square inch, maximum 13.5, but that wouldn't mean much to most people. A big speedometer is in the center with an information display inside it, and on the right is a gauge of similar size but which only contains an indicator of what gear the transmission is in, plus fuel level. It would be nice if a temperature gauge was in that space, because, as it is, you can only find out if the car is overheating by suspecting it, and then checking on the information display inside the speedo, and scrolling through the other things. The info display can also show which wheels are getting the power with the SH-AWD, or Super Handling All-Wheel Drive. This system sends more power to the outside rear wheel when the car cornering aggressively, which keeps it on line; but that's exactly the time you'd not want to look down and check which wheels are getting the power. So the display is just showing off, not an unusual thing with instruments in cars nowadays. There's also an instantaneous fuel mileage display, a bar from 0 to 50, again not practically readable. The EPA-rated mileage is 19/23 mpg City/Highway, but we got 17.6 miles per gallon (on premium fuel) at an average of 34 mph running stop-and-go on the freeway and 80 mph when we broke out. The fuel mileage didn't change much after that, mostly around-town driving. Numbers lower than the EPA rating is also not an unusual thing in cars, nowadays, which is why they'll be changing the rating system next year. The leather-wrapped steering wheel feels nice in your hands, if busy, with controls for a half-dozen or more things, including paddles for upshifting and downshifting the sequential transmission. It's kind of ugly, though. It has three spokes, at 3, 9 and 6 o'clock, and they're trimmed in aluminum-look plastic, with a design that makes the wheel look like a scale model of a space station. The most fun you can have with an Acura RDX is driving it through corners like a sports car. It does a really great job of this. The paddle-shifting transmission shifts smoothly and obeys your input, except when you downshift at an engine speed it thinks is too high, or upshift at one it thinks is too low. But at least it tells you that it's rejected your input by flashing; other systems indicate the car is in the gear you've chosen, even if they don't shift to it. This is the first turbocharged car Acura has ever made. The 2.3-liter engine is about as high-tech as they come; Honda has been the technology leader with small engines for a long time. The turbocharger changes the power characteristics quite a lot from the more peaky Acura TSX, although it doesn't smooth out the engine. There's 260 pound-feet of torque, and no turbo lag, but when the transmission is in Drive, it kicks up and down when you're driving casually uphill. To stop it, you have to use the Sport, or manual, mode. During that stop-and-go freeway traffic, we found it difficult to accelerate smoothly. Acura invented drive-by-wire throttle, and, because so many other cars with this electronic system also have hair-trigger throttles, we wonder if the system still has a ways to go. A bigger flaw than a quick throttle or unsettled transmission is the ride. Our leggy passenger, now sitting in front, said she could feel every bump, especially on the freeway. We could feel them too. It was like a jolt, over the freeway ridges. Of course, this firmness in the suspension enables the RDX to perform like a sports car around the corners. Acura boasts that it will out-corner a BMW X3, which was developed on the Nurburgring circuit in Germany. So, good for the RDX. But is it worth the trade-off, if the suspension can't also offer a comfortable ride on the freeway? Maybe; you decide. We left our RDX in California and got in another RDX in the Northwest, just in time for snow and ice. We tested the ABS by slamming on the brakes going down a steep hill with hard-packed snow at 20 miles per hour. The response was beautiful; it took a long time to get stopped, maybe 100 feet, but we were able to steer anywhere we wanted to, without sliding, while our foot was mashed to the pedal (as we watched 10 inches of snow slide off the roof and down onto the hood). We should point out that the P235/55R18 Michelin Pilot tires are considered “high-performance all-season,” meaning they weren't made for this sort of thing. Then we went to a slushy parking lot, and tried to cut donuts at hard throttle, to test the stability control, called VSA. The RDX just turned its tight circles, 39.1 feet, without sliding. Pretty amazing. A couple days later the slush froze into sheer, lumpy ice. We returned to the bottom of our steep hill. The city had put up barriers because the road was considered dangerous. We drove around the barrier and charged uphill, considering it our duty to New Car Test Drive readers. It was fascinating to feel the all-wheel drive work, and watch the readout on the instrument panel indicate with bars which of the four tires was getting the torque, based on how slippery it was under each tire at any moment. The RDX struggled, and once came to a complete halt, not spinning, just shutting down the throttle because it couldn't find grip. The RDX slid downhill backwards on the ice, with the brake pedal mashed; the ABS did not appear to be working, maybe because it had started sliding from a dead stop, so the sensors didn't know it was sliding. The RDX found a dry patch under one wheel, and when that wheel bit and held onto the patch, the vehicle turned perpendicular in the road. The 2007 Acura RDX is an all-new model, and a departure for Acura because some of the silky Acura DNA seems to have gone missing, replaced by wannabe boy-racer adrenaline. The 2.3-liter four-cylinder engine is turbocharged to produce 240 horsepower, and isn't totally tame. The firm suspension is aimed at cornering, and doesn't make many compromises. The styling lacks definition. The RDX has its moments, including some desirable touches inside the cabin and always quality engineering, but it's difficult to see the vehicle's direction. However, Acura believes that SUVs (excuse us, CUVs) like this are the future, so maybe they're just getting a head start. NewCarTestDrive.com correspondent Sam Moses test drove the Acura RDX in California and the Pacific Northwest. Head/hip/leg room, f: 38.7/54.4/41.8 in. Head/hip/leg room, r: 38.3/53.0/37.7 in. Cargo volume: 60.6 cu. ft.